Milwaukie Mayor Mark Gamba headed to a meeting. 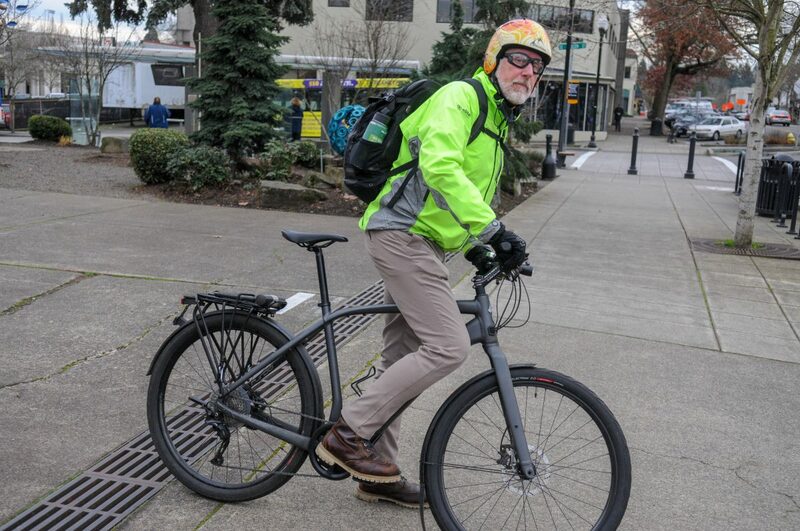 Surprisingly, the loudest political voice for bicycling in our region doesn’t come from Portland City Hall. It comes from a city hall six miles south of Portland in Milwaukie, in the office of Mayor Mark Gamba. 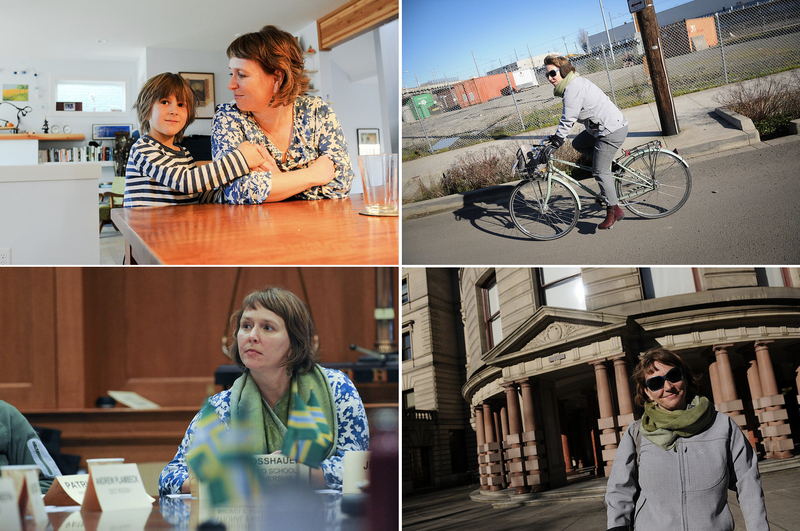 Mom, bike commuter, advocate — it’s all in a day’s work for Kari Schlosshauer. Even if you don’t know Kari (it rhymes with “safari”) Schlosshauer, chances are you’re familiar with her work. 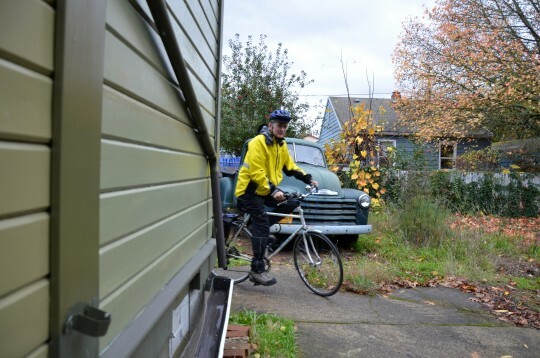 As the Pacific Northwest Senior Policy Manager for the Safe Routes to School National Partnership, Schlosshauer has spent the last five years making our neighborhoods safer for walking and biking. Her position puts here at the center of discussions and deals about how and where our city, region, and state spend money for school-related transportation projects. Schlosshauer lives in the Hosford-Abernethy neighborhood near Powell and 25th. Earlier this week I sat down with her around her kitchen table before riding downtown where she attended a meeting of the Vision Zero Task Force (she’s a member) at City Hall. This post is part of our Women’s Bike Month interview series written by Steph Routh and sponsored by the Community Cycling Center and Gladys Bikes. If you have found yourself on or even near a bike polo court, chances are you’ve met Jackie Mautner. 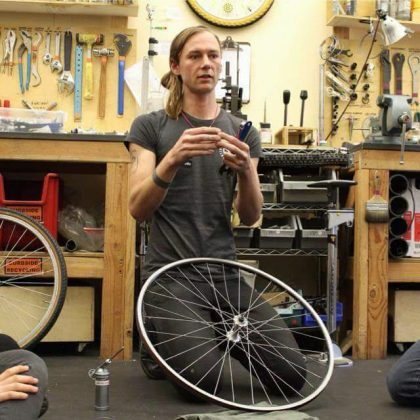 She has graced bike polo courts and on both coasts when not cultivating some serious acumen as a bicycle mechanic. Her most recent challenges have been framebuilding and cyclocross. How did you get involved in biking? Aside from biking as a kid, I started commuting when I went to college in New York City at Cooper Union. 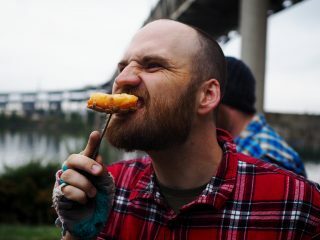 Shortly after I started biking regularly, I came across bike polo totally by chance. The court in NYC is right off a main bike artery, and I would ride by on Sundays. I would see them swinging mallets. I got curious about what they were doing, because they were on bikes. I started watching, and this person who’s been playing since almost the time that bike polo started in NYC — he’s almost 70 years old now — invited me to play. For someone his age, he’s not the fastest on the court and gets heckled, but he puts up with it. I thought if he could put up with the heckling, I could, too. 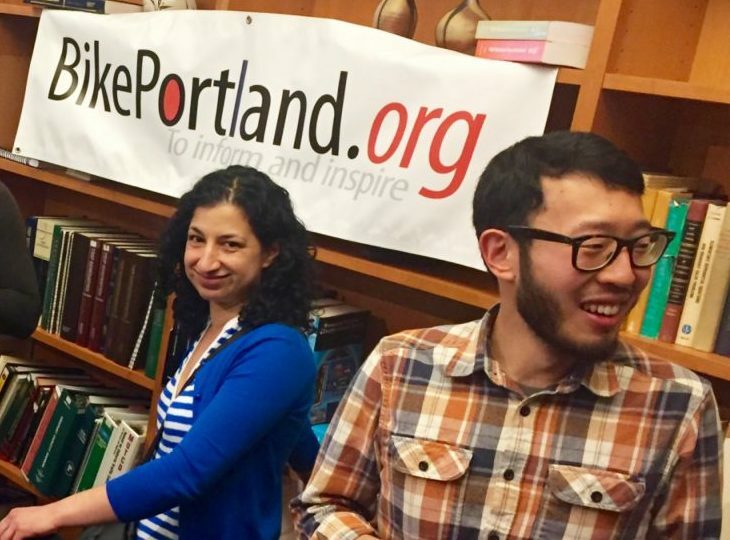 Sumi Malik, left, at a BikePortland Wonk Night. This is the fifth installment of our Women’s Bike Month interview series written by Steph Routh. This content is sponsored by the Community Cycling Center and Gladys Bikes. The role of consultant in transportation planning and advocacy is inherently behind the scenes, yet the stiff competition associated with landing the next project contract creates a unique working environment delicately balancing self-promotion and service to agency clients (and, ultimately, the communities they serve). Add the implicit biases of gender, race. etc., and the waters of transportation consulting can be tricky, indeed. Sumi Malik has been a transportation planning consultant with CH2M for over a decade, managing an array of projects in communities across the country. She also was instrumental in developing a mentorship program with Women in Transportation Seminars (WTS). This is a subscriber post by Armando Luna. 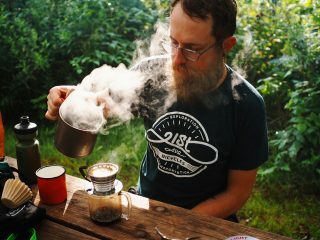 PDXCoffeeOutside is a group of bike riders and coffee lovers who meet every Friday to grind, brew and enjoy their coffee in the great outdoors of Portland. The organizers pick a different spot each week, which you can learn about on their Instagram feed, @pdxcoffeeoutside. 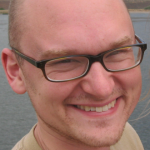 I’ve attend a few of these gatherings this summer and asked one of the organizers, Will Christenson, a few questions. PDX Coffee Outside started because a group of friends had a desire to meet up in the mornings before work (hence the 7am start time), make coffee, and socialize. Most of us have a bunch of camping gear anyways, so it’s a good excuse to use that, and we’re also pretty passionate about coffee. Black Girls Do Bike are known for many things, but one is their amazing jersey design. This is the fourth installment of our Women’s Bike Month interview series written by Steph Routh. This content is sponsored by the Community Cycling Center and Gladys Bikes. Black Girls Do Bike is a national organization with over 75 local chapters. The organization was created to champion efforts introducing the joy of cycling to all women, but especially black women and girls. Keyonda McQuarters stepped up as the Portland Chapter’s admin for about a year now and has been leading two rides on average per week ever since. She is so excited about BGDB that she was willing to spend time with me on her birthday at Bipartisan Cafe talking about it. 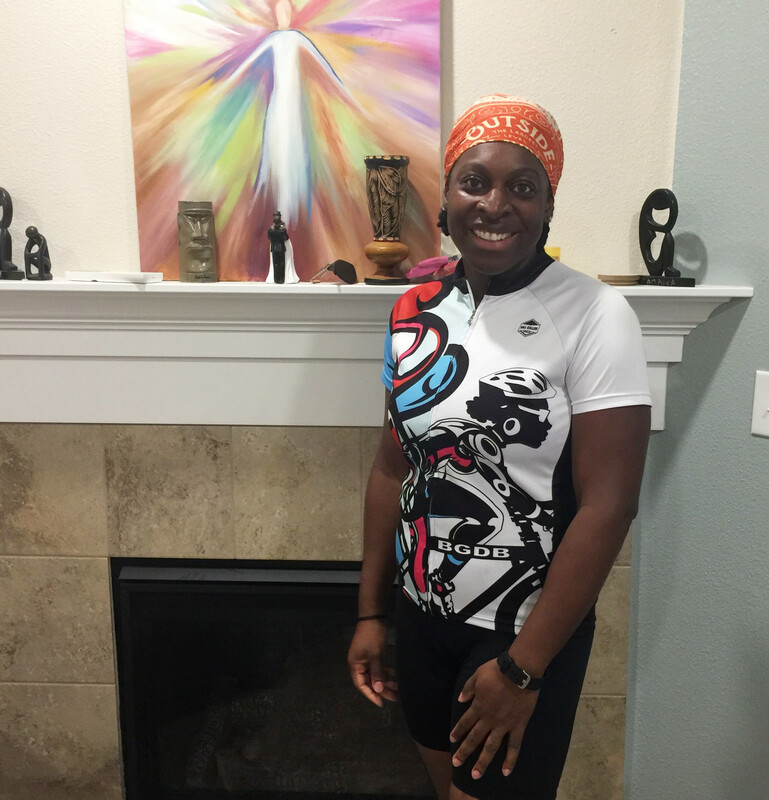 Why did you decide to lead the Portland chapter of Black Girls Do Bike? I’ve been leading Black Girls Do Bike for a year now, and I think one the of the challenges is overcoming barriers, real or perceived, that inhibit Black women from being present and involved in the bike community. Every time I’m on my bike, I’m always looking for me. I’m looking for women who look like me. While I do see them, they are few and far between. One of my goals is knocking down those barriers, of creating a community that welcomes Black women. Linda Robinson at Gateway Green back in February. This is the third installment of our Women’s Bike Month interview series written by Steph Routh. This content is sponsored by the Community Cycling Center and Gladys Bikes. 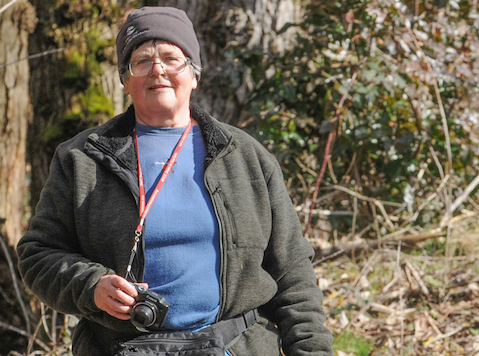 Anyone who has enjoyed a park in East Portland likely owes at least a sliver of that experience to Linda Robinson. Linda was a founding member of the East Portland Parks Coalition, is a former member of the Portland Parks Board, and has been a voice advocating for parks throughout the Gateway Urban Renewal process in Gateway. What does this have to do with cycling? Two words: Gateway Green. Linda retired in 2002 and jumped straight into advocacy and organizing for Gateway Green, which just opened this past summer. This is the second installment of our Women’s Bike Month interview series written by Steph Routh. Don’t miss her interview with Meeky Blizzard. This content is sponsored by the Community Cycling Center and Gladys Bikes. Momoko Saunders is the quintessential behind-the-scenes creator. There are those who take their applause from a stage, and those who hear their work appreciated from the back of the room. Momoko has held a hallowed place in the latter category, and it’s time to shine a light on her work. 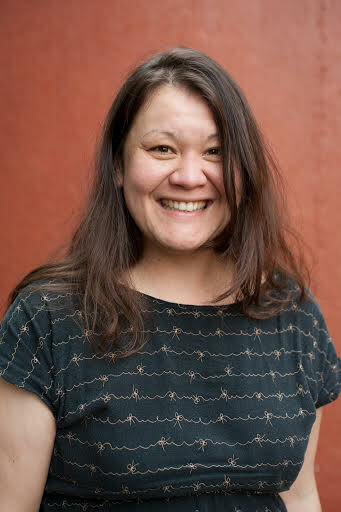 As co-founder of Bike Farm, a nonprofit dedicated to bike repair and education, Momoko developed the administrative back-end that makes or breaks any new enterprise. She volunteers on the Board of Portland Society and is an iOS developer by trade. Momoko and I met up at the Community Cycling Center office, which happens to be right around the corner from Bike Farm. How did you get started in biking? I didn’t get into biking seriously until Bike Farm and then not seriously myself until my bike tour. And then I never looked back. Written by Steph Routh, this is the first in our Women’s Bike Month interview series sponsored by the Community Cycling Center and Gladys Bikes. Every day we travel past, on, or under structures and streets named for the people who had some relationship to its construction. Ladd’s Circle. Flanders Street. Naito Parkway. The Glenn Jackson Bridge. 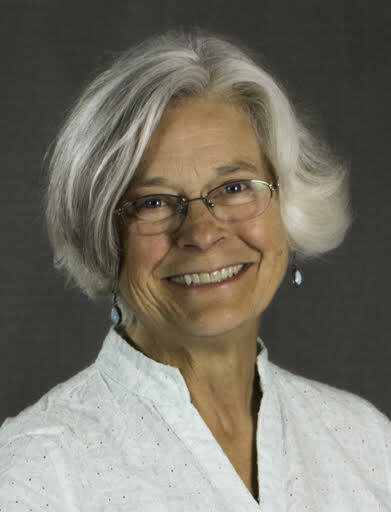 Meeky Blizzard’s name is not attributed to a structure, because she made her mark on transportation and land use planning with the structure that was never constructed — the Western Bypass. Instead, the planned Western Bypass corridor from Tualatin to Hillsboro remains largely agricultural land, thanks to Meeky and other activists who started the group Sensible Transportation Options for People, also known by its apt acronym STOP. Meeky and other STOP members opposed the project and instead proposed alternate solutions that were eventually codified in the Land Use, Transportation, Air Quality (LUTRAQ) study. 167 of Doug Klotz’s neighbors voted this fall to kick him off the Richmond Neighborhood Association after 22 years. He survived the recall attempt by a single vote. It’s 8:10 a.m. on Friday morning and the most controversial man in the Richmond neighborhood has just finished reading the funnies.